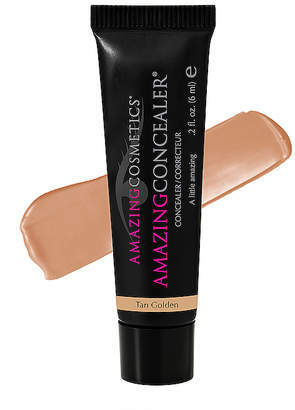 Amazing Cosmetics Amazing Concealer in Beauty: NA. Amazing Cosmetics Amazing Concealer in Beauty: NA. A staple product for pro makeup artists and beauty insiders, the Amazing Cosmetics Amazing Concealer is an all-around winner. This ultra-pigmented, water-resistant formula is packed with antioxidants, cucumber fruit extract, and Vitamin E to provide breathable, long-wearing coverage while nourishing, de-puffing, and soothing the skin. The creamy texture blends seamlessly, banishing dark circles, blemishes, and redness without caking or creasing.. Tan Golden - suitable for medium to olive complexions with golden undertones. Suitable for all skin types. Paraben and cruelty free. 0.2 fl oz. ACOS-WU12. ACTGSML.